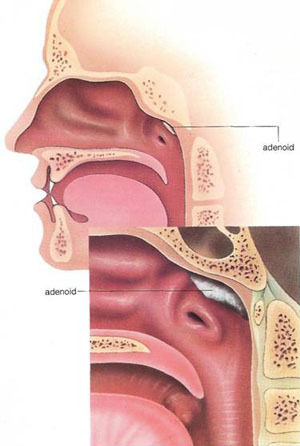 Adenoids are masses of lymphatic tissue in the upper part of the pharynx (throat) behind the nose, which form part of a child's defenses against disease. They normally disappear by the age of ten. When infected, the adenoids become swollen, and may need to be removed surgically. See also lymphatic system.